It’s my 🎂birthday month🎂 and I’m prepping to share major content with you all through ♉️ ✨Taurus Season! Although Aries stars like my mum are having their birthday moment RN specifically, I’ve been doing a little shopping for my trip to LA🌇 next week and a few perfect pieces have me all caught up! 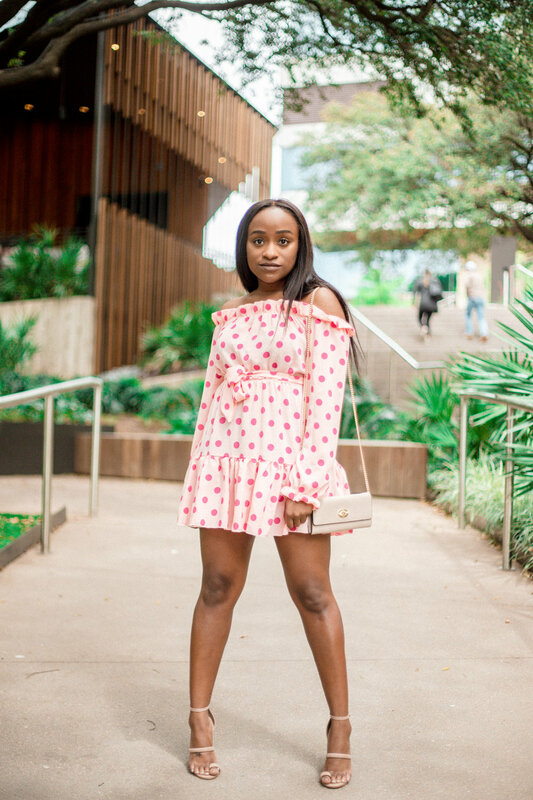 Check out the one of my current obsessions that would also go great in your wardrobe: the pink polkadot OTS dress. I won’t even lie, I’ve been in a really 💖pink mood💖 as of late, and since it basically looks absolutely incredible on any shade of melanin, I have to share these shopping deets. It’s been a while since I’ve gushed over Pretty Little Thing, but lemme get back on this wave. Shop my current print and color obsession with these picks from Pretty Little Thing! Can we just take a moment to stan this naturally gorge Fenty Beauty Stunna Lip Paint in Uncensored? !